It has been a long weekend here and the weather has been great! John and I have been gardening for most of it - we put in a new 35 sqm veggie garden bed and I've spent the last 2 weekends filling it, creating a mulch path around it, and today, doing a bit of planting out. John has been working on the other veggie beds. Over the past couple of years our goal has been to grow all of our own vegetables and this year, for the most part, we have done it - I did have to buy some onions and carrots a few times, but that was it. It means a lot of work, eating strictly seasonally, but we love knowing exactly where our food comes from. I did manage to do some drawing this afternoon and here is my Monday Moleskine for this week - just by the skin of my teeth! A bit of smudging from the pen I'm using which is annoying. 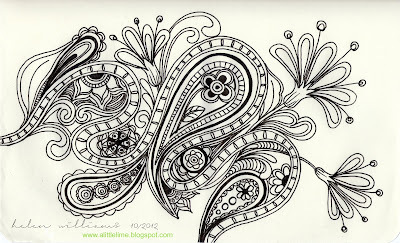 This one started with the loopy path through the centre and is showing my paisley love. I also added to my granny's bonnet drawing from a few days ago - it felt out of balance and I was not at all happy with it. I should have just left it for a bit till I could figure out what it needed. The finishing touch came to me last night just before I went to sleep - I didn't even know I was thinking about it! LOL. I decided to extend the lines from the centre pattern, and add some shading. (I've changed the image on the original post to the new one :) Much happier! I've been following your blog for a little while and I think the art you do is beautiful. I just wanted you to know that I'm putting up a picture on my Tumblr of my attempt at your Knyt link feather. I made sure to give you credit for the design and put a link to your blog, so I hope you won't mind that I posted it. If you do have a problem with it then just let me know and of course I'll take it down. 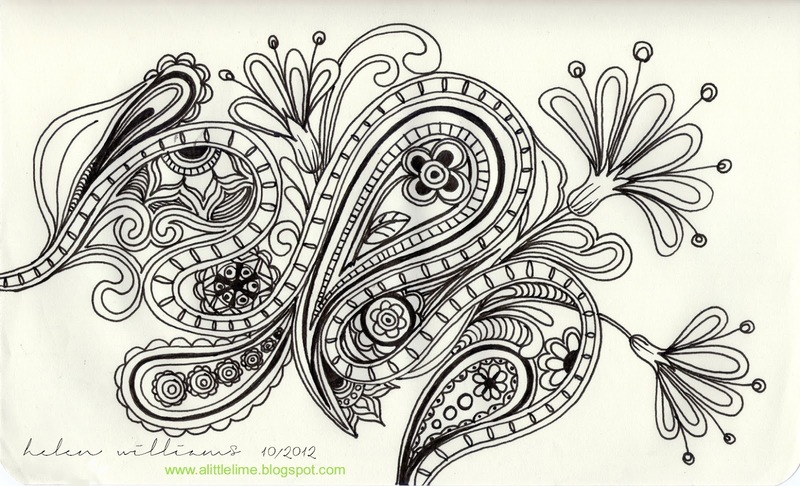 The patterns are there to use and I love seeing others work with them :) Your drawing looks wonderful - sorry I couldn't comment on it (I'm not on tumblr and couldn't find a way around it). I, too, love paisleys - well, the swoops & swirls, anyway. (lol) This of yours is so pretty!